We the undersigned are appalled and anguished by the continuing state repression on mass movements and social activists by a pro-business state which is giving up its democratic pretensions with each passing day to suppress all genuine protests by farmers, workers, adivasis and different marginalized social groups who are driven to the brink of starvation, dispossession, mass peasant suicides imposed on them by an increasingly authoritarian state which goes out of its way to serve its imperial masters and the big business. Binayak Sen and Seema Azad were given life sentence by an equally complicit judiciary. The former were guilty of taking sides with the oppressed masses. Thousands of false criminal cases were imposed on the activists of POSCO and Koodankulam. The list is endless. The latest examples are Dr Sunilam and Dayamani Barla. Imprisonment of Dr Sunilam, a socialist politician from Madhya Pradesh has been received with a sense of deep concern and dismay as part of a trend to silence voices of public interest by misleading the judiciary to save vested interests. Dr Sunilam has been part of Indian People's Movement against WTO and anti-corruption movement in the country. Former legislator and President of Kisan Sangharsh Samiti, Dr Sunilam led Kisan Andolans. On 12 January, 1998 which was a black day for the farmers’ movement of our country, the State Government under the leadership of Digvijay Singh brutally crushed the non-violent farmers’ movement using the state police. Taking note of Dr Sunilam’s background, the appeal for supporting him merits endorsement of all the concerned citizens who love democracy and cherish citizen’s liberty. The case of Dayamani Barla who is a journalist turned anti-displacement, tribal, woman activist from Jharkhand as part of a similar trend to harass public interest persons. She was granted bail by a local court of Ranchi on October 18, 2012. But she was arrested again when friends and colleagues of Dayamani reached jail to receive her, they were told that she is been arrested in the Nagadi case and can’t be let off. She was sent to Jail on October 16, 2012 in fourteen days judicial custody, after she surrendered before the court in a matter of April 25, 2006. This not the first time when she is intimidated or harassed but the government is leaving no chance to target her. The recent intimidation and arrest is due to her leading a restless, successful and mostly peaceful (except once when police opened fire on villagers) struggle against the acquisition of fertile land at Nagari, a village situated at few kilometers from the state capital and where government wants to build IIM, IIT and National Law School. The government is desperately trying to crush the movement, by hook or crook. It is not a matter of Dr Sunilam and Dayamani Barla alone. Harassment of activists on fake pretexts and conviction in fabricated cases has become a trend that merits the response of the sane legal, social and political minds to defang the bite of the strategic lawsuit against public participation. 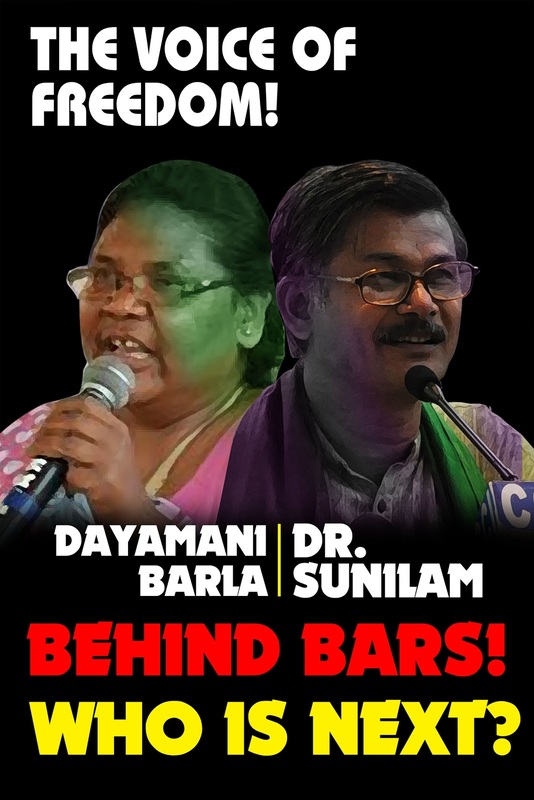 We condemn this dastardly act of incarceration of Dr Sunilam and Dayamani Barla and urge the governments of MP and Jharkhand to withdraw all cases against them and release them unconditionally.